In May 1911, Victoria Louise accompanied her parents on a state visit to the United Kingdom. 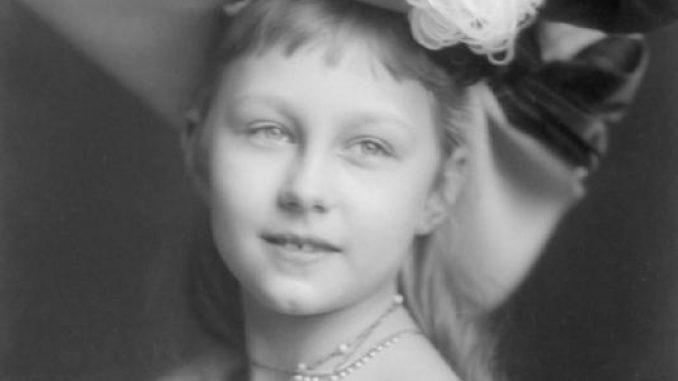 Immediately there were rumours that she was to be engaged to the Prince of Wales, the future King Edward VIII, who was 17 at the time. She remembered him as nice but also thought he looked terribly young. In any case, the rumours remained rumours. At the beginning of 1912, Victoria Louise became ill with bronchitis and spent several weeks recuperating at St Moritz. While travelling to Bad Homburg to join her mother, news arrived of the death of Prince George Wilhelm of Hanover. 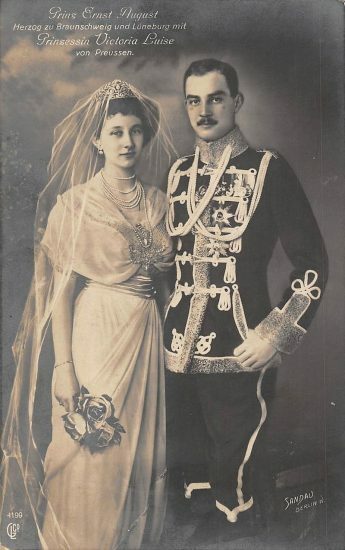 He had been on his way to the funeral of King Frederick VIII of Denmark – his uncle – when he was killed in a car accident near Nackel in Mark Brandenburg. Upon her father’s orders, her brothers Prince Eitel Fritz and Prince August Wilhelm went to the lying-in-state and formed a guard of honour. Shortly after this, Prince George Wilhelm’s younger brother Ernst August came by to personally thank the Emperor. Ernst August was now the heir to the defunct throne of Hanover, from which his family had been deposed by the Prussians. Upon his first meeting with the Emperor and Empress, Victoria Louise found him quite stiff and solemn – he had just lost his brother after all. When the topic came to horses, Victoria Louise offered to show him her thoroughbreds, and the ice seemed to finally have been broken. She later wrote that she was in love with him at first sight. 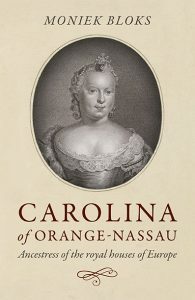 Her mother wrote, “He certainly made an impression on my child from the first. God knows whether it will ever come to anything.” In the end, the Duke of Cumberland, Ernst August’s father, renounced any claims to the Duchy of Brunswick in favour of his son and Ernst August was to refrain from claiming the Hanoverian throne. In May 1913, they were to be married, and it would turn out to be the last great gathering of foreign royals before the First World War. On 24 May, Victoria Louise put on a wedding dress and was helped with her bridal crown and a veil by her mother. After the exchanging of the vows, a 36-gun salute was fired. The day ended with a banquet attended by a 1,000 guests. Her father made the toast, “My darling daughter, today, as you leave our house, I want to thank you from the bottom of my heart for all the joy you have given me and your mother, and for the ray of sunshine which you have been in our house.” They spent their honeymoon climbing the mountains and walking in the woods of Gmunden.